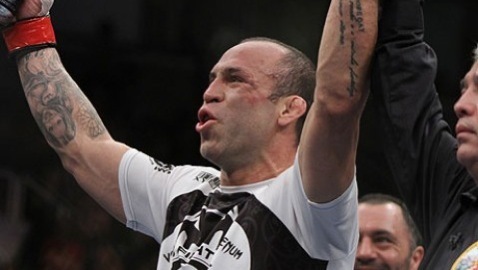 On Wednesday, a fight between Chael Sonnen and Wanderlei Silva appeared to hinge solely on the former Pride FC champion’s health. Less than 24 hours later, however, the bout has reportedly gone off the rails. Sonnen continued his pleas for the fight with Silva on Wednesday’s Fox Sports Live. UFC president Dana White, an in-studio guest on the show, said he was ready to make the fight and designate it the UFC 167: St-Pierre vs. Hendricks co-main event, as long as Silva was healthy. Silva’s health doesn’t appear to be a factor, but what he wants for compensation seems to have killed any hopes for the bout. “(Silva) said he won’t fight (Sonnen) unless he gets PPV (points), so I guess he’s gonna retire,” White wrote via text message to MMAFighting.com on Thursday, effectively saying the fight was not going to happen. Pay-per-view points are a percentage of the revenue that the promotion receives from pay-per-view purchases of the event. Vitor Belfort and Lyoto Machida could have been other options for Sonnen, but Belfort has already agreed to a rematch with Dan Henderson and Machida has signed on to fight Tim Kennedy. So where does that leave Sonnen, who has indicated he wants to return to middleweight? “We will figure it out,” said White. For now, however, Sonnen’s future doesn’t appear to include the Axe Murderer. Silva did not respond to multiple requests for comment.